Find the best Blink eye drops for lubricating contact lenses or easing itchy dry eyes. If you wear contact lenses, you'll know how important it is to use a good quality contact lens solution that lubricates your lenses before insertion. But sometimes, your eyes need a little extra hydration during the day, for instance in a dry air-conditioned office or on a hot humid day when sweat is pouring into your eyes and the salt from your perspiration is making your eyes itch like crazy. Blink eye drops, made by Abbott Medical Optics (AMO) offer the perfect solution and there are a number of different Blink products to suit chronic dry eye sufferers as well as those who just need a little help during the day to maintain contact lens comfort. 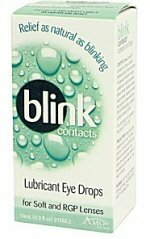 Blink Contacts® are one of the best eye drops for lubricating RGP (rigid gas permeable) contact lenses; they can also be used with soft lenses. The act of blinking is the eye's own natural way of renewing the tear film that keeps your eyes moist, but you can use these drops to rewet and lubricate rigid gas permeable (RGP) and soft contact lenses. Great for people who find their soft lenses are uncomfortable occasionally and, for RGP lens users, it's a sure way to make them more wearable in dry environments. The drops are made with OcuPure®, a gentle preservative that is peroxide-free, and other ingredients which are found naturally within the eye. The silky smooth texture means you can have comfortable lenses all day long. While Blink Contacts® are one of the most popular products in AMO's eye drop range, there are other Blink eye drops for dry eye called Blink Tears®. These drops come in two forms, one for mild dry eye sufferers, Blink Tears® and the other with additional gel for medium to severe chronic dry eye problems called Blink Gel Tears®. 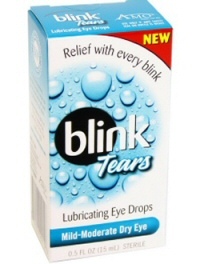 The makers are so confident that your tear film will be replenished every time you actually blink, they offer a 100% satisfaction guarantee; if you don't think they provide absolute comfort, just send back the remains of the bottle with your receipt to get a full refund! So there's no risk in trying Blink eye drops to soothe dry eye syndrome or just to give some extra comfort to your eyes in dry conditions. Tip: It's always a good idea to check with your optician or a local pharmacist before using a particular brand of eye drop; just to make sure they are compatible with your existing contact lens solution.